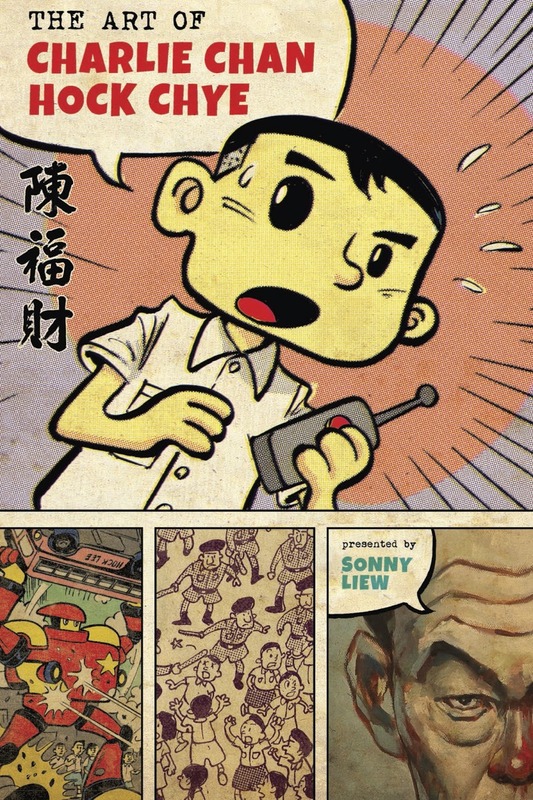 The Art of Charlie Chan Hock Chye (TACCHC) is one of the best biographies I have read about a comics artist, which is doubly impressive given that the subject of the biography is fictional. It is truly amazing how much was fabricated for this book. It is full of dazzling details, including in-progress sketches, manga excerpts, paintings, museum pieces, and other artifacts that make this book seem as chock-full and well-researched as an actual artistic biography. Mort Drucker, Frank Miller (a la Dark Knight Returns) and Winsor McCay. And perhaps the fact that all of these styles are borrowed are supposed to speak to the collage that constitutes Singapore's culture. Whatever the intention, the amount of thought and craft in this book is astounding. It is truly a work to read, ponder, and contend with. Sonny Liew is the artist/creator of this book. 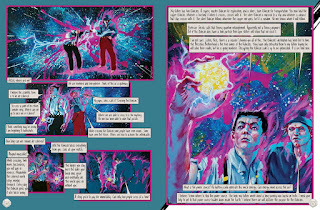 He has been nominated for an Eisner Award and is best known for his collaboration with Gene Yang, The Shadow Hero, as well as his artwork on the current Dr. Fate series. His past works also include Malinky Robot, Vertigo’s My Faith in Frankie, and Marvel’s adaptation of Sense and Sensibility. He speaks extensively about his work on TACCHC in this interview. All of the reviews I have read of this book either praise it or remark on just how substantial and complex a work it is. Douglas Wolk called it "a mercurial delight." 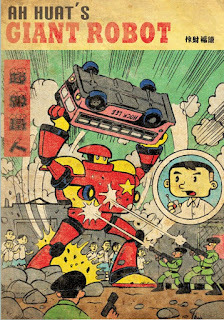 Etelka Lehoczky wrote that it seemed that Singapore itself, "the pressure-cooker country — tiny and polyglot, globally competitive and politically repressive — seems to have been poured into this dense book." 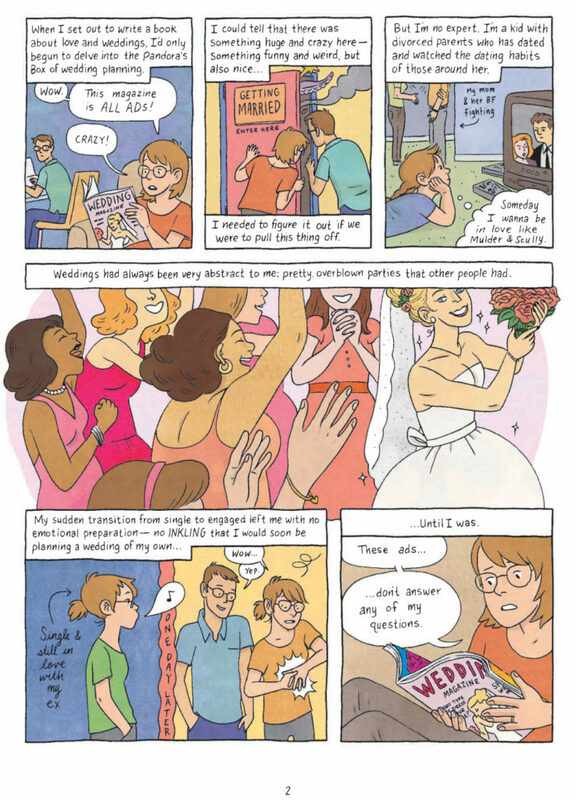 Dan Kois called it "funny and rich and satisfying, and one of the best comics of the year." 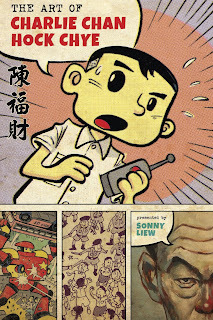 The Art of Charlie Chan Hock Chye was published by Pantheon and they have more info about it here. One of the highlights of my year was to speak about Th3 Anomaly, a unique, fantastic experience. It's both an art installation and a graphic novel. 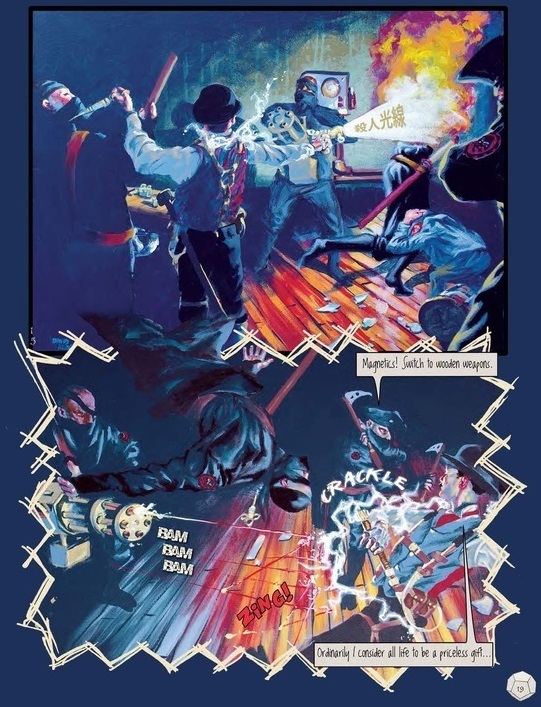 Funded in part by a Kickstarter campaign, this steampunk narrative stars Nikola Tesla, Jules Verne, and Sarah Bernhardt as wayward travelers who end up embroiled in a time travel caper. 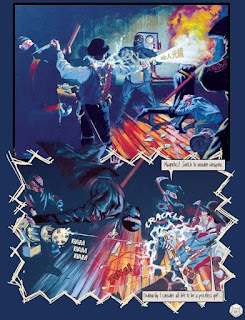 They sail flying pirate ships, contend with ninjas, assassins, and cyborg warriors. They strive against the machinations of a shadow organization who seeks to find, steal, and exploit puzzle devices called Rubicons that hold the key to traveling through time and space. There are also romantic and family relationships that complicate matters, and the plot is a fun one that holds up well with further readings. (Personally, I felt the book was pretty dense the first time through, but I got much more out of it during return readings). 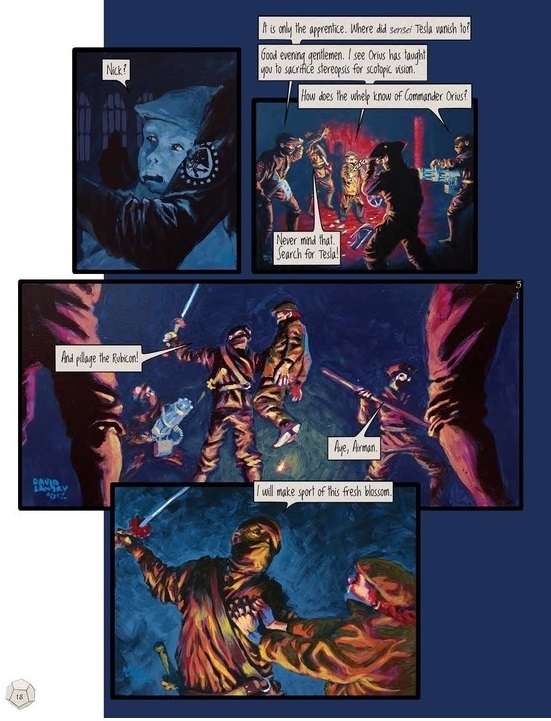 As you can see from the excerpt above and below, the artwork is gorgeously rendered through paintings, which are also available from their author/creator David Landry. It was my distinct pleasure to get to speak about this work during the Integrative Research Panel that closed the 2016 Literacy Research Association Conference in Nashville, TN. It was great to hear about varying views and analyses of the work, as well as hearing the author speak about it. Also, getting to see a chapter's worth of paintings as well as some of the props and costumes used to stage and create the artwork was a very rewarding and thrilling experience. Personally, I found it fascinating to speak about the mechanics of comprehending comics with how they represent and filter experiences of time and space when talking about a work that so explicitly trucks with those concepts in terms of its story and composition. At some point the talk will be posted at the LRA Conference page, and I feel it will be well worth checking out or revisiting. 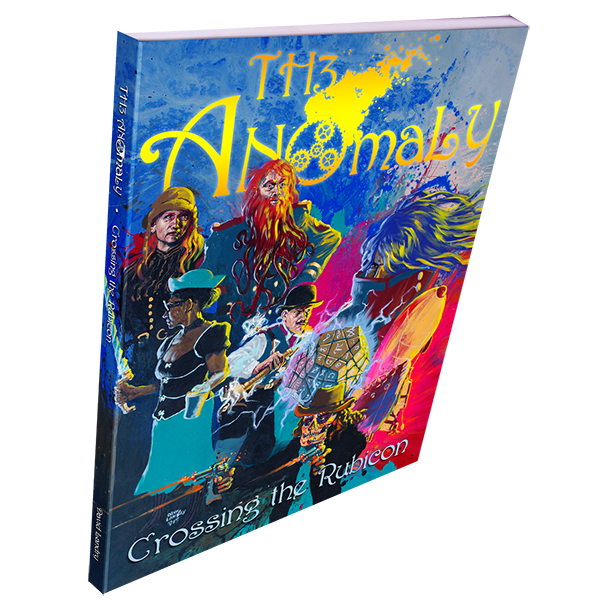 Th3 Anomaly was a project from abrasiveMedia, and you can buy the book digitally or in hard copy directly from them here. You can also learn more about abrasiveMedia in this article. 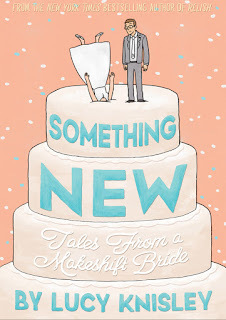 Something New is the latest book by Lucy Knisley, whose memoir Relish was one of my favorite books of 2013. Like all of her works I have read, this book is also autobiographical, an account of her relationship with her husband-to-be John as well as their unique wedding. It is full of her trademark personality: original, quirky, nerdy, and funny. I love how she is very honest and unassuming about herself and her life, and her voice comes through so strongly its palpable. 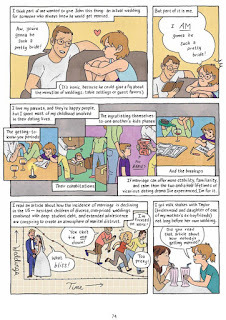 What's also excellent about this book is that it is not just a personal tale, but it also explores questions about why people get married, why certain customs exist, and how marriages typically play out. Also, there are a few places where she explains strange wedding customs or gives other interesting or amusing factoids. It works very well not just as a story about marriage but also a commentary on marriage as an institution. I am not going to lie. I loved this book. And after reading it, I want to hang out with her and her husband, and I am sort of bummed that I do not know them at all. 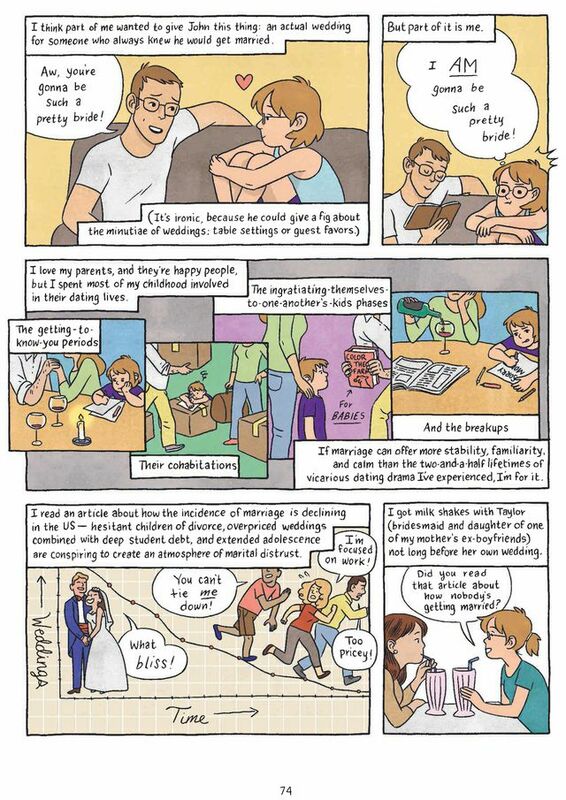 And perhaps my favorite bits are where she includes actual photographs of the events, which highlight the moments she captures so well in her storytelling.This book is at once intimate and universal, while also being entertaining and funny. It's utterly heartwarming in the best sense of the word. All of the reviews I have read about this book have been positive. Oliver Sava praised "the clean, expressive style that makes Knisley’s work so rich and engaging." 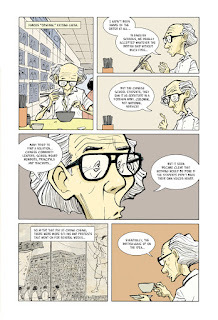 Kirkus Reviews called it "a visual and emotional achievement." Publishers Weekly stated that Knisley "has a knack for presenting a highly precise type of whimsy that stops just shy of precious overkill." 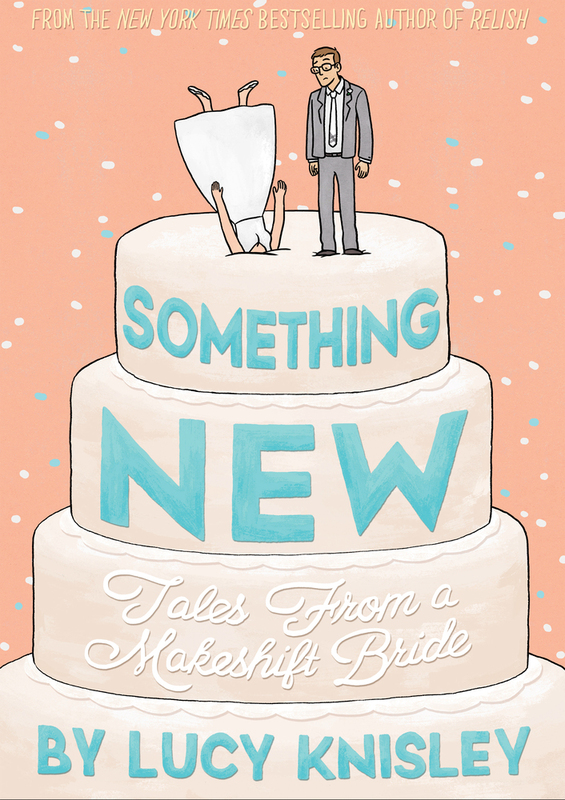 Something New was published by First Second, and they have a preview and much more available here. I read a lot of comics over the course of a year, and I do read a bunch of superhero ones, too, though I rarely review them here. For this book, I will make an exception. 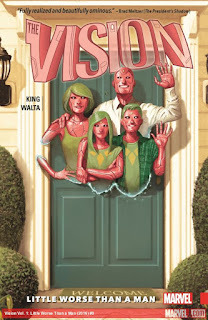 Vision is a recently completed 12-issue series collected into two trade paperbacks. 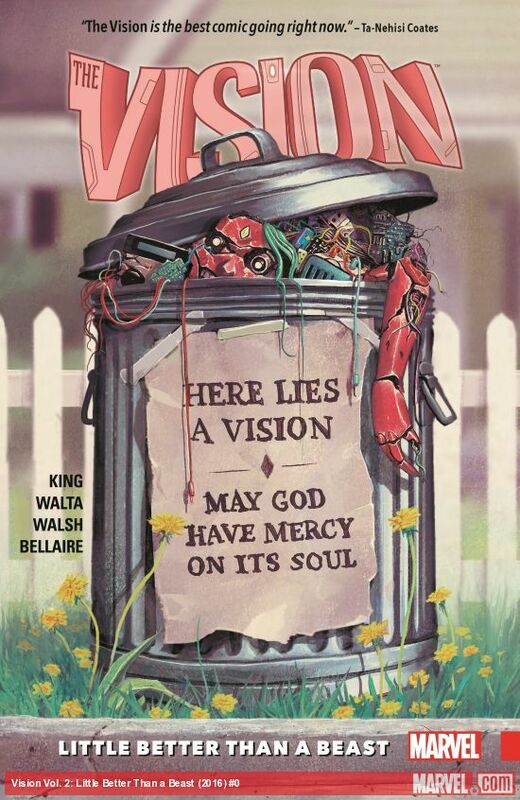 The main character is The Vision, a synthezoid with incredible powers originally created to destroy The Avengers. Now this character has existed for decades and has a very convoluted history, and this series takes it all into account while telling an original, streamlined, and compelling tale. Also, impressively, I feel like it is still completely accessible for someone who is new to the character. In response to all that has happened to him in the past, Vision decides to literally make a family and move to the suburbs. He synthesizes a wife (Virginia), two children (Viv and Vin), and a dog, and moves to Arlington, Virginia just outside of Washington DC. There, they try to fit in, doing normal things like going to work, keeping a house, and sending their kids to school. Of course, nothing can ever be normal and things get strange. Villains and shades from the past creep into the present, and there are a few shocking developments that turn into murders. All of these twists and turns seem part of a standard superhero yarn but here are all turned on their heads, put into a much different context, which makes the story so much more interesting, horrifying, and affecting. No matter what is happening in these books, the events are filtered through the reactions and sensibilities of this family, and they are surprisingly well-realized, complicated characters. Their wants, needs, and personalities take center stage and elevate the narrative tremendously. These books are some exceptionally well composed, both in terms of the story and the artwork, with cliffhangers and revelations that hit with great impact. 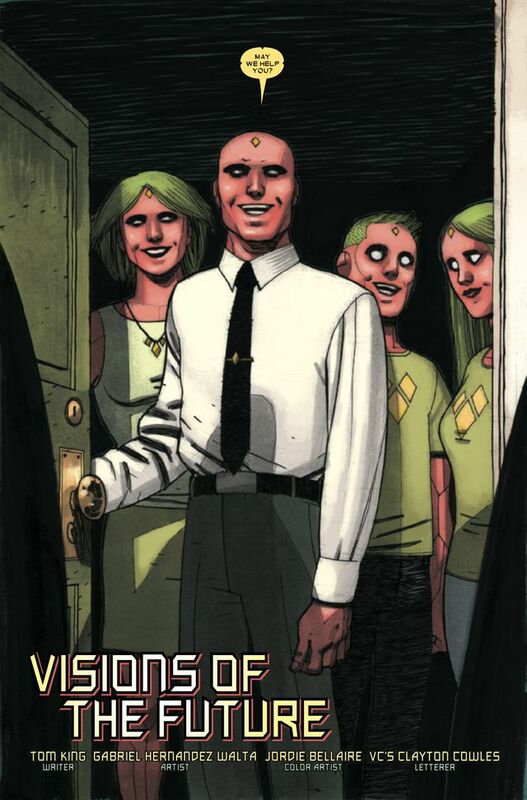 This series was created by Tom King, a comics writer who has since signed on exclusively to DC Comics, and Gabriel H. Walta, who has drawn a good number of comics for Marvel. Jordie Bellaire colored the entire series, which looks beautifully dark and muted for the most part, though the constant repetition of reds and greens creates an otherworldly tone. 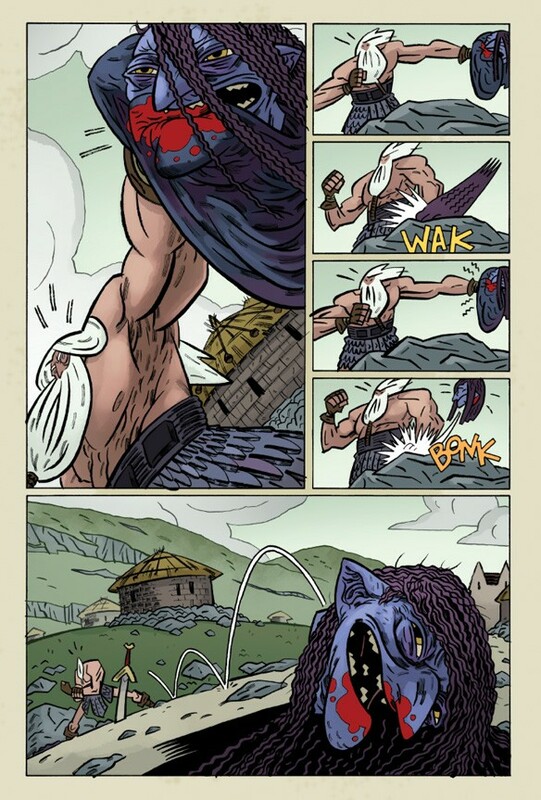 Artist Michael Walsh also drew one of the chapters. King speaks more about his view of this series in this interview. All of the reviews I have read of these books have been full of praise. Rich Johnson piled on some hyperbole, called the series "Marvel’s Watchmen." James Whitbrook wrote, "That complete tonal difference, and the way it holds up a subversive mirror to everything The Vision has been about as a character for years, is what makes The Vision unlike anything we’ve seen from Marvel in such a long time." 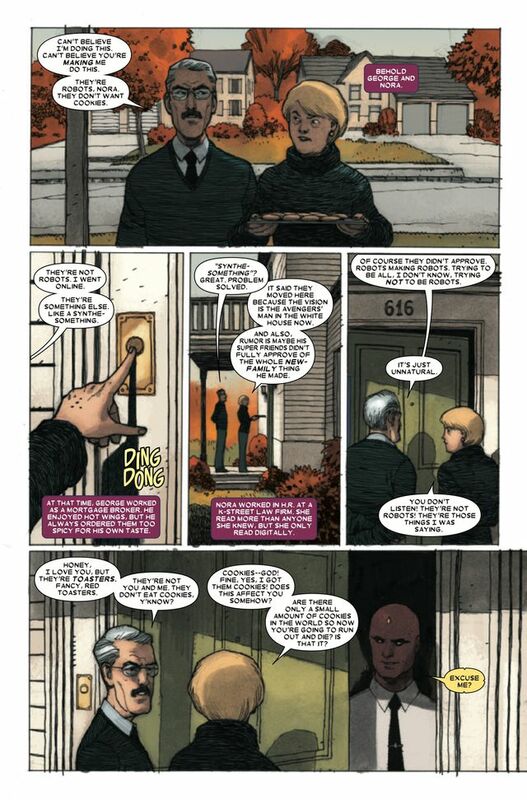 Laura Sneddon summed up, "Overall, this is an unexpected modern classic from Marvel, and unquestionably their greatest comic this year." 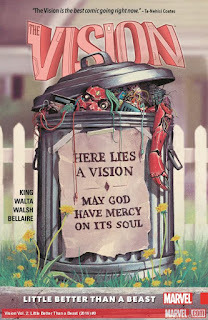 Vision was published by Marvel Comics and they have more info about the entire series and these collections here. Ever humble, he would prefer to just be called Norgal. As his many monikers imply, he is a skilled monster slayer, and his specialty is cutting off their heads. Here he is hired by the ruler of Barra to rid the realm of a plague of beasts unleashed by an evil sorcerer. He is accompanied on his journey by the head of Agatha Blue Witch, who constantly annoys and cajoles him. In this book, he encounters and fights many adversaries, including the evil sorcerer, ghosts, giants, witches, giant fire-breathing wolves, a conniving royal advisor, greedy and vengeful priests, and a treacherous little man named Gnym. All of these creatures and beings are wonderfully, horrendously, and gorgeously drawn, which adds tremendously to the appeal of this book. There are also lots of twists and turns, double-crossings, and surprises in the plot that keep things very interesting and compelling for the reader. 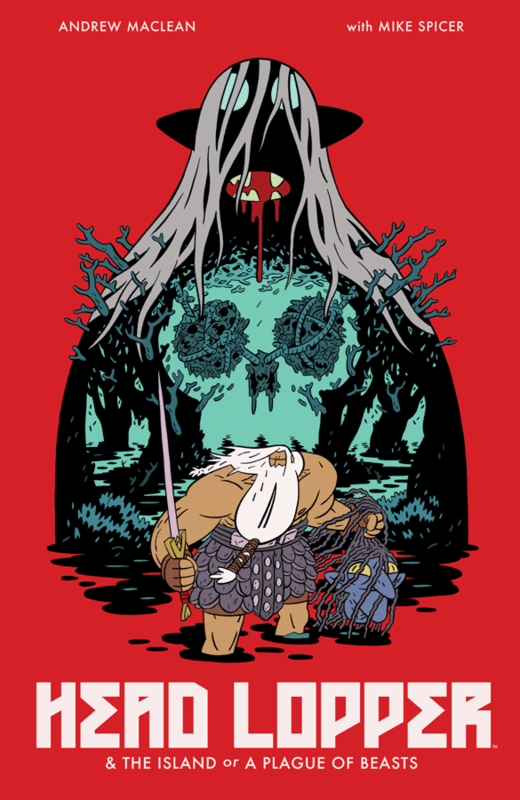 This beautiful genre confection was created by Andrew MacLean, whose earlier graphic novel Apocalyptigirl was similarly fun and sumptuously illustrated. He might not have much work published as of yet, but the ones he display an excellent sense of craft and artistry. 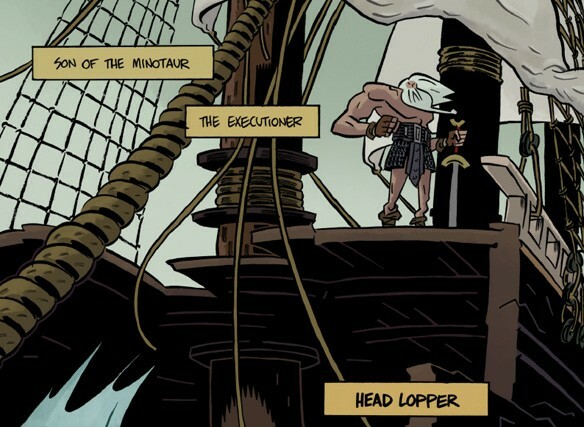 He speaks at length about his work on Head Lopper in this interview. All of the reviews I have read about this book have been ringing. Justin Partridge wrote, "Rarely has high fantasy looked this stylish or been this fun of a read." 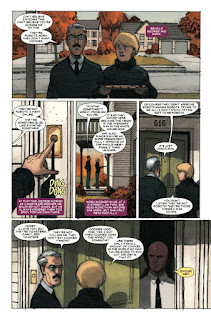 Publishers Weekly opined that "the strength of the action sequences and dynamic page layouts make it a worthwhile read overall." Patrick Larose praised MacLean as he "manages to take these typically thin-character types and makes them feel full and engaging again." Head Lopper Volume 1 was published by Image Comics, and they have more about the book and series here. This book is pretty violent and bloody and has a few spots of profanity, so it is suggested for readers mature enough to handle those things. 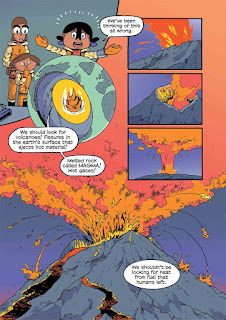 Volcanoes: Fire and Life, the third volume in the Science Comics series, approaches its subject matter via a science fiction tale. In the not-too-distant-future, the Earth is in another Ice Age, and humans are scrambling to find anything they can to use as fuel to keep warm. Aurora and her brother and sister Sol and Luna are being taught by their instructor Pallas to track down resources, when they happen upon a library. Instead of looking at the building and its contents as possible fuel, Aurora starts exploring the books and learns all about volcanoes. Much of what she finds informs her about life on Earth before she was born. It also inspires her to explore solutions to their current situation, but she gets push-back from her siblings and teacher. Still, she is very persistent and her explanations touch on a lot of information about the Earth, plate tectonics, earthquakes, and volcanic activity. She gets into all kinds of historical and technical information, and all of this data comes across in an interesting way. Moreover, I enjoyed how this book also presents a conundrum where people have to puzzle out different methods to solve a pressing problem and use science to find solutions. This book is not just didactic, it's also very engaging. 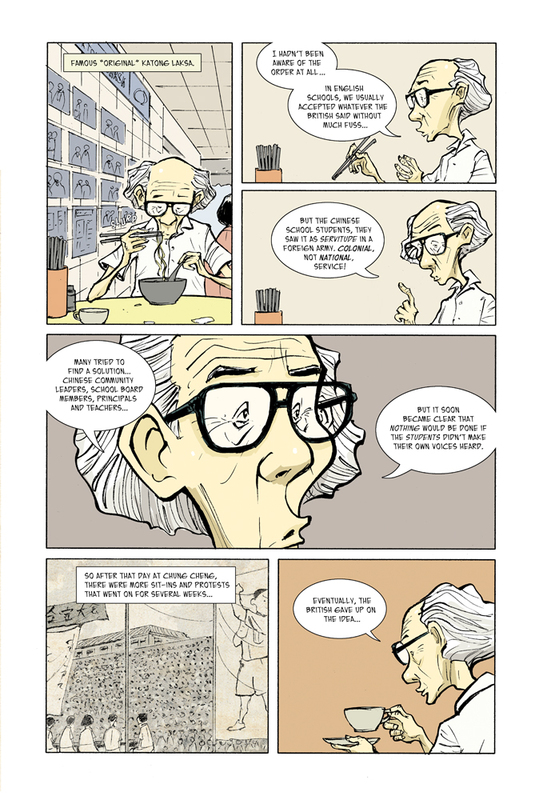 This volume of Science Comics was created by Jon Chad, an instructor at at The Center for Cartoon Studies. 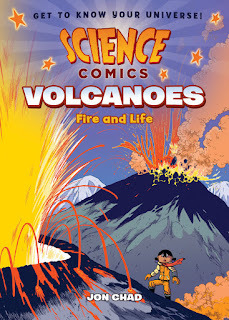 He has a couple of other excellent science themed graphic novels under his belt, starring his Leo Geo character. He also wrote and drew a bunch of mini-comics and zines as well as the horrible and hilarious The Bad-ventures of Bobo Backslack (not for children). He talks about his work on Volcanoes in this interview. All of the reviews I have read about this book have been positive. Johanna Draper Carlson wrote that "Chad does a great job keeping both the story and the education moving along." 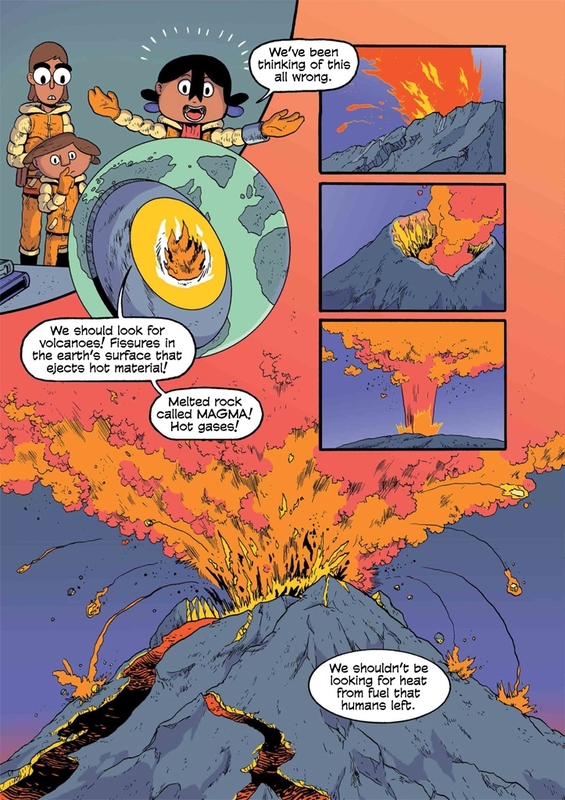 Russ Dobler opined that "The information in Science Comics: Volcanoes is expansive and well-presented, with the use of narrative hammering home otherwise hard-to-retain concepts." Rosemary stated that "The diagrams are vibrant, with comic book art adding some fun and easily memorable background information to the mix." Volcanoes: Fire and Life was published by First Second, and they have a preview and much more available here.